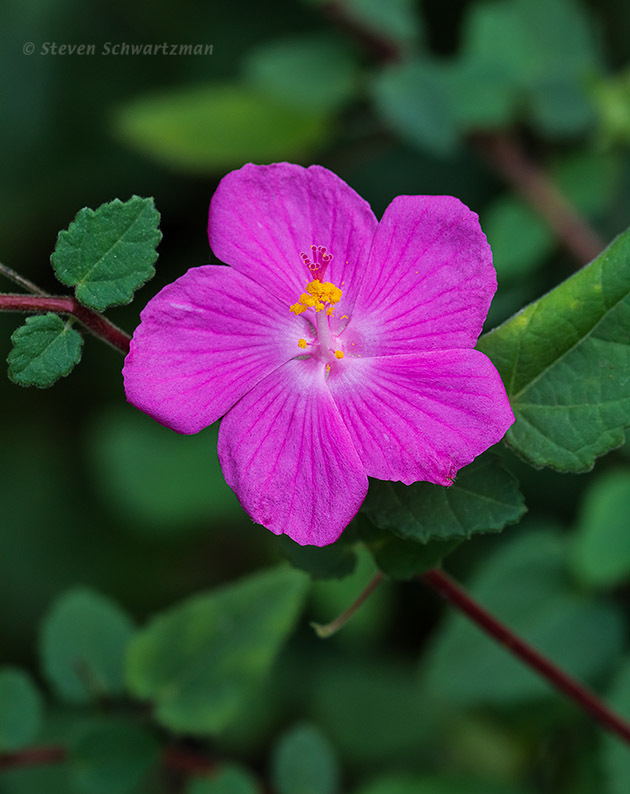 On the October 15th walk through Great Hills Park that brought you yesterday’s green-dominated picture of mosses and ferns, I also photographed this Pavonia lasiopetala, which is variously known as rock rose, rose pavonia, rose mallow, and pavonia mallow. Its flowers are typically 1–1.25 inches (25–32 mm) across. In the United States this species is found only in Texas, and then only in a few of its counties, of which I’m glad that Travis (which includes Austin) is one. Just as small palafoxia made its début a few days ago, rose pavonia makes its first appearance in these pages today. Nice photo of this beauty, a beauty that I don’t know before now. Even in the United States most people wouldn’t be familiar with this species, given that it grows natively only in Texas. People in central Texas who want to landscape with native plants often turn to pavonia mallow. My wife planted one by the side of our house, where if flowered nicely for several years before finally dying, but not before it gave rise to a couple of new plants nearby. It is interesting to see all your different flowers but it also comforting to see that you have some from the mallow family that look similar to ones we have in Europe. Lovely photograph. Thanks. One of my references says that there are 111 genera in Malvaceae, with some 1800 species, so I can understand why some of the ones in Europe would resemble this one. Some of those in France could even be from America originally, thanks to human agency. I do love all the plants I’ve come across in the mallow family, and this new one is also very attractive – the leaves as well as the flowers. Usually when I’ve photographed this species I’ve done tighter shots of the flowers or even just parts of flowers, but this time the greenery caught my attention, too, so I took a broader picture to include more of it. It’s beautiful. Love that brilliant pink against the greens. Maybe it’s just me but I also see the resemblance with the hibiscus flower. Hibiscus is a member of the mallow family, so there is indeed a resemblance. Very nice! I visualize a nearly overhead image of a dancer twirling clockwise, with her arms reaching skyward, and the flowing skirt flaring outward. The white and pink at the center and transitions are nice accents. Thanks for your imaginative interpretation. Can you turn the design and color of this flower into a flaring skirt for real? Was für eine schöne Farbe und diese Blüte…wunderschön!!! What a beautiful flower and color, say Mathilda. Danke. The pink color of rose pavonia is preserved very well in your macro image. I actually have this plant in my yard and it has grown here for more than 35 years. It was given to me by a botanist named Mauldin, She and her husband grew lots of native things that survived the heat and drought. Their farm in Robinson,Tx is now a subdivision. Mr. Mauldin had 100 acres of restored prairie and now you could not find a sprig of prairie grass if your life depended on it. So goes the way of population over growth. Sort of like the way non-native species such as honeysuckle, china berry, and Johnson grass, invade and take over. Sorry that was probably not a nice analogy to compare humans to invading species..
It’s good that you have rose pavonia in your yard—and have had for 35 years! It’s sad that so much has been lost and keeps being lost. What a Hot Pink Beauty! Yes, HPB it is. I saw some this morning in San Marcos, about 30 miles south of Austin. Wow this really brightens up the day, especially during a hurricane! Great photo Steve! Happy hurricane (that’s a strange greeting, isn’t it?). At least this pavonia brightened your day. Another great portrait of a flower I never knew about. Your site is a joy to view … this great botanical compendium of Texan wild flowers. When I got interested in native plants in 1999, I was impressed by the large number of species that grow here in central Texas. The more the merrier, as I see it—and you get to see it, too. Mallows make great bee plants, the pollen is so easy to access and they get covered with a gorgeous yellow coating of it. Yes, and it isn’t only those bees. Before Europeans brought honeybees to the New World, the the prominent stamen columns on the mallows here attracted all sorts of other native insects to do the job of pollination. They have blooming their hearts out in my front yard all this fall, with somewhat higher than usual rainfall and humidity…..original seeds came from the Sierra Madeira in NW Pecos County, an astrobleme sitting near the edge of the Glass mountains……..which are part of the Permian reef………all of it green this fall instead of burning either with drouth or fire as it was the two previous falls, drouth not over but at least it’s resting. Grass has gone to seed everywhere and the area southwest where the big fire was last year is completely covered with ripe grasses……..hate to see the dead pinons but hope the damned mountain cedars don’t crown sprout. I have never seen one of these in the wild, though I planted one a few years ago and it blooms like crazy through much of the year. LIke you, I hadn’t initially seen these in the wild, but in the last few years I’ve begun coming across wild populations. I’m glad to hear yours blooms like crazy. Such a beauty. I see the name honors botanist José Antonio Pavón Jiménez. Ironically, there is a hurricane connection of sorts, as the Pavonia PATH station in New Jersey was affected by Sandy, along with the Newport/Pavonia neighborhood. Good for you for having done the research on José Antonio Pavón Jiménez. Your mention of the Pavonia PATH station brings back memories from the winter and spring of 1967. I was finishing my senior year at Columbia then, and while I was a student during the day, I was teaching English to foreigners in Jersey City at night. When I couldn’t catch a ride by car with one of the other teachers from Manhattan, I rode the subway downtown and switched to the PATH, getting off in Jersey City at the Pavonia station. Emerging into the darkness of that eerie industrial wasteland was an experience that I thought of as surrealistic. It’s strange for me to be thinking about it again in a blog about nature in Texas, a state I was then still several years away from even visiting for the first time. I have pavonia blooming right now in my Dallas County yard, and have seen it growing wild at the Connemara Meadow Nature Preserve in Collin County. Didn’t realize it was limited to Texas! the species isn’t native in Dallas, but many people who want plants that are native to Texas have planted it in various parts of the state, and sometimes it has escaped into the wild. Pavonia mallow is also native in northern parts of Mexico.